Have Fun With Marble Dyeing Saturday 25th May 2019 Time: 8.45am - 2.00pm Want to know more? Click on Classes & Workshops tab above. How to Make a Wristlet Purse When : 29th June 2019 Time: 8.30am - 4pm Want to know more? Click on Classes & Workshops tab above. 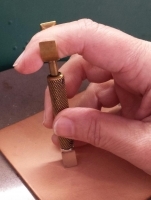 Learn to Carve &Tool When: Saturday 18th May 2018 Time: 8.45am - 12.45pm Want to know more? Click on Classes & Workshops tab above. 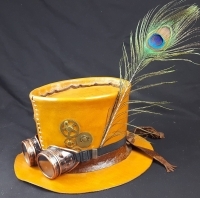 Learn to make a Top Hat (Steampunk or not) Time: 8.30am - 5.00pm Dates: 24th August 2019 Want to know more? Click on Classes & Workshops tab above. Make a Belt or Dog Collar When: 15th June 2019 Time: 8.45am - 1pm Want to know more? Click on Classes & Workshops tab above. 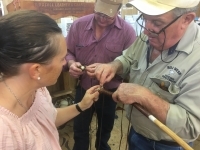 Make your own Leather Jandals When: 12th October 2019 Time: 8.30am SHARP - 2.30pm Want to know more? Click on Classes & Workshops tab above. Saturday morning class 8.45am -12.45pm Want to know more? Click on Classes & Workshops tab above. Tuesday Classes 10am - 2pm Want to know more? Click on Classes & Workshops tab above.